I was browsing through my profile on Pokemon Go and I saw a list of medals. The list contains goals to reach, but it does not explain what they are good for. Other than personal satisfaction, do they serve any in-game purpose? In the case of a Pokémon being a dual-type (Magnemite (Steel/Electric)), you will receive a bonus catch rate equal to the average of your catch rate bonuses for each type. For example, if you have a Bronze Depot Agent (steel) badge and a Silver Rocker (electric) badge, you will get a bonus catch rate of +1.5, as you get +1 from Depot Agent and +2 from Rocker. NOTE: This answer has been significantly edited with some changes made to Pokemon GO. My original answer is available here, and is still valid for older versions of Pokemon GO (which are no longer playable). While medals used to confer no benefit to players, this has changed on 0.41.2. Now, type medals (Gardener, Hiker, etc...) will grant a catch bonus for Pokemon of the same type. For example, if you are trying to catch a Meowth with a Schoolkid medal (Normal Medal), it will be effectively easier to catch that Meowth. Gold Medals (200+ of any given type) will confer an x1.3 bonus to your catch rate. Silver Medals (50-199 of any given type) will confer an x1.2 bonus to your catch rate. Bronze Medals (10-49 of any given type) will confer an x1.1 bonus to your catch rate. This bonus is attached to the catch multiplier through multiplication, allowing a noticeable increase in catch rates. It may also be important to note that if you attempt to catch a dual-type Pokemon, your medal bonus is determined by taking the midpoint (or average) between any applicable medals. However, non-type medals still have no effect and are just there for cosmetics and the all-important Achievement Get! feeling. Earning medals do not unlock unique rewards, however, you do earn a small amount of experience for each medal you unlock. No, they serve no in-game purpose other than personal satisfaction. It's perhaps built in to actually give you a feeling of a real-life Pokemon GO adventure and you as a real-life Pokemon trainer; how much you travelled, how many you caught, what are your achievements and more. Don't you think the game would've looked incomplete without those medals showcase? P.S: Contradictory to what is said in the other answers, I've seen absolutely no XP benefit of earning a medal. How much xp/prestige do you gain at a gym by training? Are there skills other than attack type in Pokemon Go? What is a pokemon's “Level” and it's purpose? What is the “regional Pokémon” for south America? 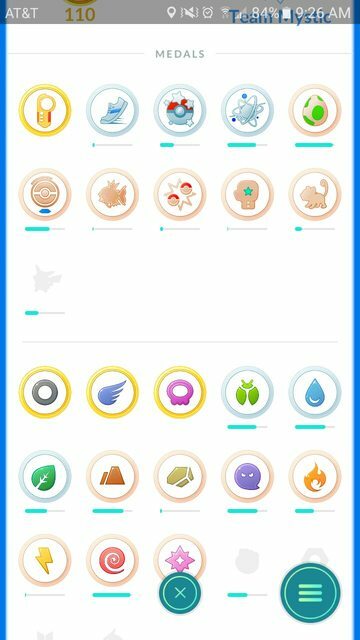 What do the medal icons at the top of the catch screen mean? What can affect a Pokemon's ability to be captured?